Richard Smith is, er, was the Mayor of Ferryhill, a small town in County Durham. Until this week, that is, when he was forced to resign after a local drag queen outed him for being a total homophobe. Last month, drag performer Tess Tickle drew attention to Smith’s history of antigay social media posts, including a video saying gay men are “worthy of death”, a “Straight Pride” poster, and several anti-trans memes. “I was in total shock and disbelief that the mayor of Ferryhill was posting such hate against homosexuality, Islam, and transgender people,” Tickle told local media at the time. Smith initially responded to the criticism by saying he never intended to offend anyone with the posts, but that he stood by his beliefs. “The posts are on my personal Facebook page and are not connected in any way to my role as the mayor of Ferryhill or as a councillor,” he said. In other words: Sorry, not sorry! “Whilst the instigators are very much in the minority, as evidenced by the widespread messages of support I have received, I realize that my ability to serve the people of Ferryhill in the manner I would have wished will always be subject to disruption and intimidation. Sorry, dude, but the only person who discredited you was yourself. sure, he never intended to offend anybody. more evidence that religion and politics shouldn’t mix unless it’s your intent to foster a theocracy. but now he can spew his hate full time from the pulpit under the guise of ‘christian love’. maybe his congregation can give him a raise for all the ‘good publicity’ they’re getting. I’m so confused by the cartoon. Why is the ‘Women’ sign on the inside of the door? Why is there just a toilet in the middle of the bathroom with no stall? Assumedly, then, it’s a single-stall restroom. So why is the mother and her kid in there? Are they supposed to be the pervs? I think the mother is the perv. Get out of the restroom, lady, stop barging in and watching people pee. Weirdo. Alex, your post is excellent. I wasn’t thinking about any of the crap that was actually in the “cartoon.” I took a quick look and, seeing what it was, moved on. Once I see such crap, it’s not worth the one brief look. The arseholes who communicate such crap are beyond any amount of time and effort to spend on them and their homophobia and transphobia. Unfortunately, these “good-loving-christian-haters” will be with us always. . . .
Haha. Mommy IS the weirdo!!! That image was beyond ignorant. 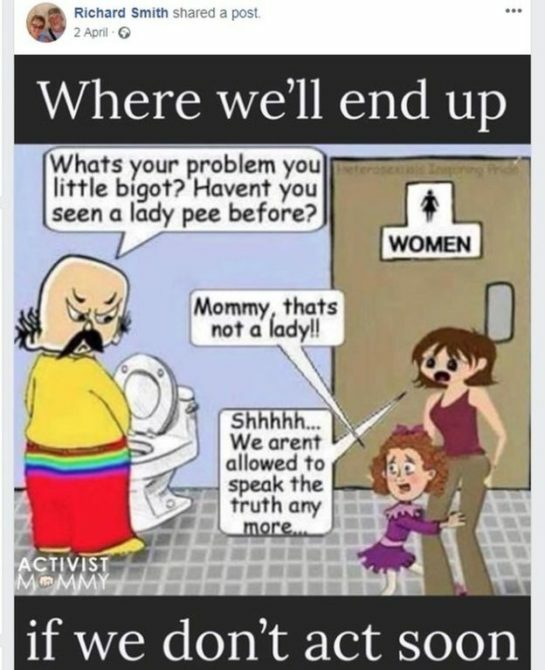 Every time this bathroom argument is brought to light….again, it’s about some big hairy guy in a dress in the ladies room (not too mention standing in front of a toilet with no stall). Really? Most people wouldn’t recognize a trans person anyway if they sat on their head and chirped. Get some education idiots. So… at no place in this “news” item did you actual say what country this happened it. I Googled it. It’s in the UK. Could have been Ireland, Canada, or even someplace in the US. I assumed it was the U.S.; the “whilst” threw me for a sec but I thought maybe he was just being fancy. In what way were his personal views “twisted” exactly? My Respect to you ?????? Tee hee! Doncha just luv those religious righteous homophobic? I think it a good thing to be reporting this mayor’s cartoons and other homophobic tweets that way everyone will know exactly where he stands. Racists and their ilk rarely will state what they really feel in a live setting before the cameras. Now all his constituents will know and he can remain if they feel his views are the type that would be a positive one for his community. Can we force President Tramp to resign for being a total homophobe and make him take his entire cabinet with him? There are 1.2 million people in the USA that are HIV+ and we have come so far since the early days of the virus to find a cure (Which is on the horizon) and keeping infected people healthy for years to come but there is a major hurdle President Trump and the current admiration do not want to see tax payer dollars spent on the gay community or those infected with HIV! A lot of funding that we have had since the days of Clinton has all but dried up and it is becoming harder and harder for those who are infected to receive proper medical care and get their medication! Recent studies prove that people who are undetectable cannot pass on the virus to others but they cannot stay undetectable without proper medical care and the medicines they need to stay healthy! Mr. Trump to hell with your wall instead of further alienating our neighbors to the south have a heart and do what you and your administration can to keep the HIV virus from rearing its ugly head again and seeing thousands of people get infected from a virus you can help prevent them from getting in the 1st place by helping people who are already infected and educating those who are not so they won’t become part of the 1.2 million people already infected!